With one exception, each entry contains a link to my full review and an excerpt from said review that best explains why I enjoyed the book. I was going to write a new paragraph for each entry, but then I realized I didn’t have anything new to add apart from what I had already said before. So, why repeat myself? One important note: This list contains books I read this year, regardless of the year they were originally published. I didn’t read enough novels that were published this year to create a Top 10 solely of 2014 releases. Like Quiet author Susan Cain, I’m an introvert. I tend to listen more than speak. I thrive at deep conversations with friends or others who share common interests and passions, yet I stall when making small talk with strangers. I prefer solitary activities like reading and writing over large social events (though I enjoy concerts, literary events, and aerobics classes). So, when I found Quiet on a store shelf, I knew I should read it to gain a better understanding of introversion, and of myself. To say the book succeeded would be a colossal understatement. At the same time, Quiet doesn’t feel like a scholarly work. Cain argues her points with eloquence, succinctness, and care. She even describes her various interviewees with the same keenness that fiction writers use to make their original characters come to life; these real people leap off the page. Also, while Cain is passionate about introversion, she’s careful not to hyperfocus on that one temperament. She spends ample time distinguishing the differences between extroverts and introverts, and explains how the two can learn to respect those differences and appreciate the other’s strengths. Her last few chapters also offer suggestions on how people of different temperaments can communicate with success and mutual understanding, from working and romantic partnerships to parent-child and teacher-student relations. It’s clear that Cain envisioned introverts and extroverts alike would read Quiet and catered her book to educate and appeal to both personalities. For introverts like myself, though, Quiet is more than just a learning tool. Many of the interviewees’ quotes resonated with me at the most personal level – because if I had been in their shoes, I would have made the same observations. I related to Isabel, Maya, and other young students as they struggled with social interactions at school – because years ago, I was just like them, unsure of how to speak up in crowded classrooms and weary from the overstimulation by day’s end. Anything I found helpful or want to refer to in the future (especially some of Cain’s advice in the final chapters) is now underlined in pen or marked with a colored Post-It flag. Normally my critiques would start creeping in here – but with Quiet, there’s not a single thing I would have done differently. This comprehensive resource radiates with conscience, empowering the quieter, thinking types without tearing down their more gregarious counterparts. Cain isn’t just an author here; she’s an articulate, compassionate guide who dives into the heart of her subject matter and writes in a way that’s easy for all readers to follow. If you’re an introvert, you’ll love and relate to Quiet. 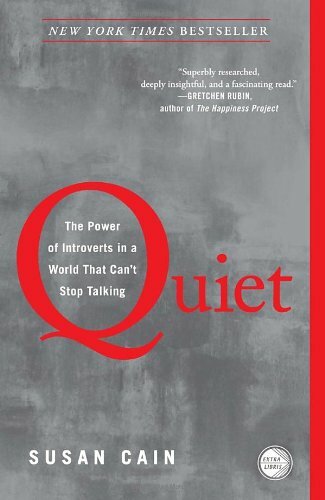 If you’re an extrovert who wants to better understand introverts, you should also read Quiet. Regardless of your temperament, make sure you take your time with this book to let its messages sink in. It’s that informative, and that profound. Have you read Quiet? What did you think of it? If you haven’t read it yet, do you think you might check it out based on what you’ve read above? Let me know by commenting below or visiting the same review at Amazon or Goodreads.